A Russian Progress 65 cargo ship fell back to Earth in pieces after a catastrophic launch failure, Russian space agency officials said Dec. 1, 2016. An uncrewed Russian cargo spacecraft fell back to Earth shortly after launching toward the International Space Station (ISS) today (Dec. 1). 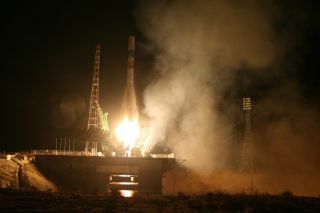 The Progress 65 freighter lifted off atop a three-stage Soyuz-U rocket at 9:51 a.m. EST (1451 GMT) today from Baikonur Cosmodrome in Kazakhstan. About 6 minutes into the flight, Russian mission controllers stopped receiving telemetry from the cargo ship, and radar stations were subsequently unable to pick it up on its planned orbit, said officials with Roscosmos, the Russian federal space agency. "[Most of the] cargo spacecraft fragments burned in the dense atmosphere," they added. "The State Commission is conducting analysis of the current contingency. The loss of the cargo ship will not affect the normal operations of the ISS and the life of the station crew." While the investigation into today's launch failure is ongoing, early indications point to an issue with the Soyuz's third stage. "Basically, what we saw was indications of the third stage sep[aration] occurring a few minutes early, and we haven't had any communications with the Progress at all," mission controllers at NASA's Johnson Space Center in Houston told NASA astronaut Shane Kimbrough, the current ISS commander, as the situation was unfolding. The Progress was loaded up with more than 2.5 tons (2.3 metric tons) of equipment, food and other supplies for the astronauts aboard the orbiting lab. The freighter was supposed to arrive at the ISS on Saturday (Dec. 3). Progress is one of four uncrewed resupply vessels that currently fly missions to the ISS; the others are Japan's H-II Transfer Vehicle (HTV) and the Dragon and Cygnus spacecraft, which are built by the American aerospace companies SpaceX and Orbital ATK, respectively. Three of these four vehicles have suffered mission failures recently. A Cygnus was destroyed just seconds after liftoff in October 2014 when its Antares rocket exploded, and the Progress 59 mission failed in April 2015 due to a problem with the linkage between the spacecraft and its Soyuz rocket. Then, in June 2015, a Dragon was lost just minutes into flight when its Falcon 9 rocket broke apart. An HTV is scheduled to launch toward the ISS on Dec. 9.